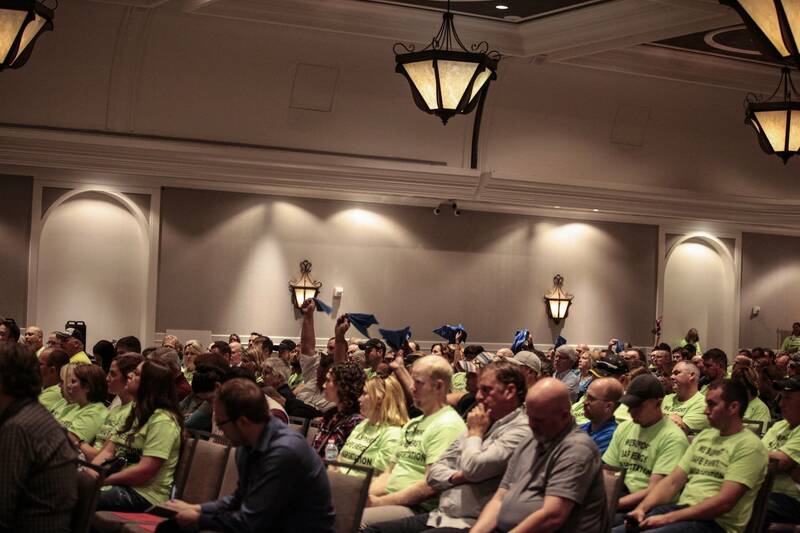 Updated: 5:45 p.m. | Posted: 11:40 a.m.
Minnesotans clad in neon-green T-shirts or waving blue handkerchiefs filled a St. Paul hotel conference room Thursday to sound off on a controversial oil pipeline proposal. This week, state regulators kicked off a round of 18 public hearings around the state on whether to allow Enbridge Energy to construct a new oil pipeline to replace its aging Line 3 pipeline. The administrative law judge who's holding the hearings will consider all public comments as part of a giant report she compiles. 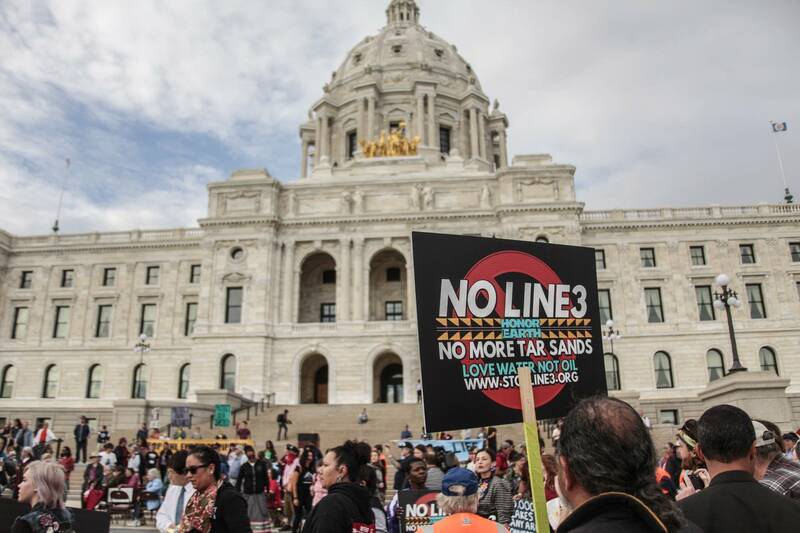 The judge will then issue a recommendation to the Public Utilities Commission, which will likely determine Line 3's fate in April. 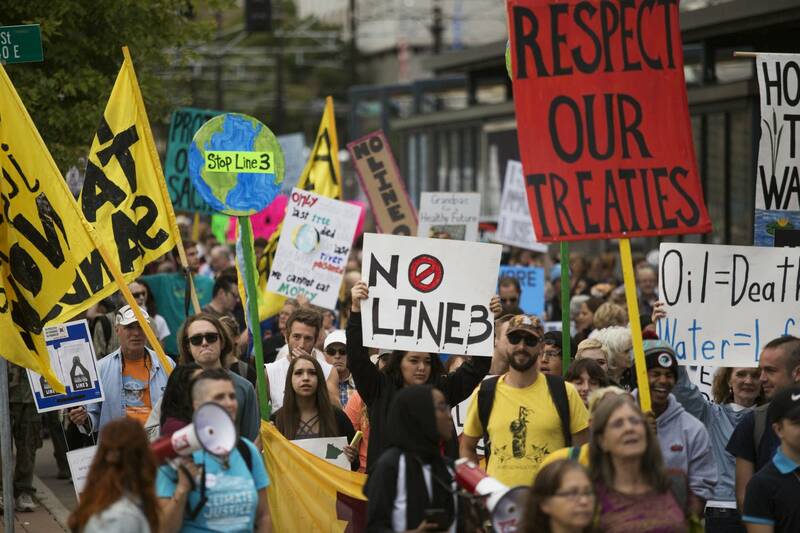 Debate over the pipeline is pitting climate and environmental concerns as well as Native treaty rights issues against energy needs and potential economic benefits from construction jobs and the $7 billion Enbridge would invest in Line 3. 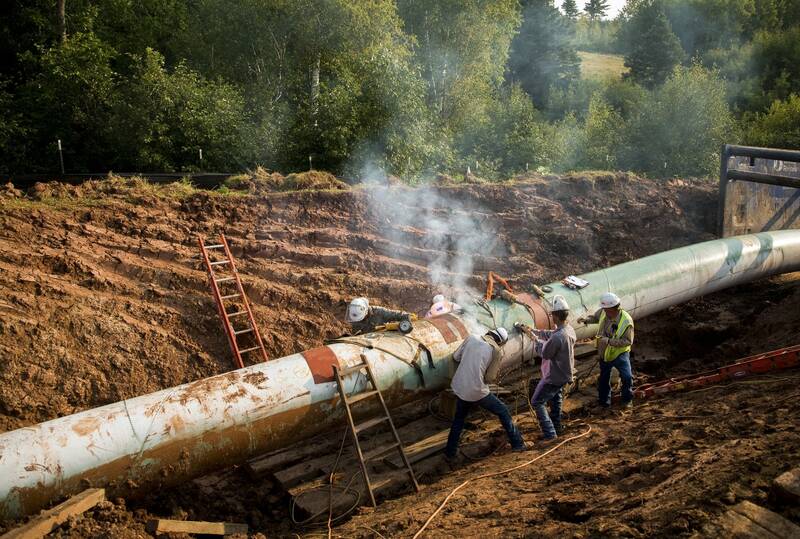 • More: Does Minnesota really need a new oil pipeline? Many people against the line say it's time to stop investing in oil and move toward renewables. "This is a litmus test for whether we take climate change seriously," said state Sen. John Marty, DFL-Roseville. Most of the speakers Thursday were anti-pipeline, and their fellow opponents would silently wave the blue handkerchiefs in support of their arguments. Among the pipeline proponents, many of whom wore neon shirts reading "We support safe energy transportation," were Enbridge employees from Duluth and Superior, Wis.
"Until we manage to power our homes with wind, sun, and have electric cars ... oil will continue to be the lifeblood of the economy," said Eric Beck, an Enbridge employee in Superior who testified Thursday. Enbridge's preferred route for Line 3 runs through lakes, rivers and wetlands of northern Minnesota. Native people who testified Thursday argue the route also threatens land where they have treaty rights to hunt, fish and gather. Tribes' voices have grown in prominence issues like this since the Standing Rock protests against the Dakota Access pipeline last year. "I don't really think anybody understands the full impact of what this proposed pipeline would do," testified William Paulson, who said he was with the White Earth Nation. Enbridge bills the new Line 3 as a replacement for an aging, corroding line. 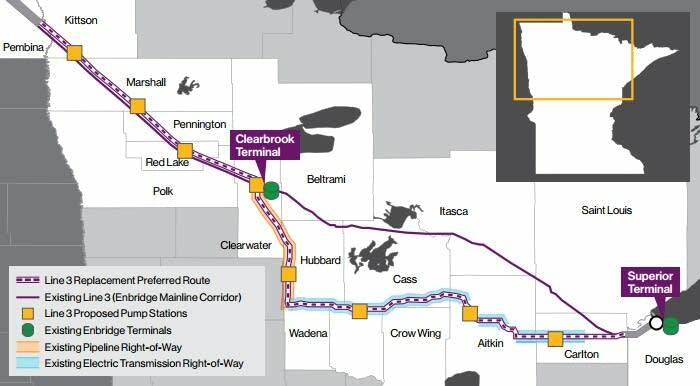 Opponents argue it's more than a replacement, since the new line would be able to carry nearly twice as much oil, and would follow a different route across northern Minnesota. For Enbridge, it's a safety issue. The company says if a new line is built, it will decommission the old pipeline, clean it out, and leave it underground. Earlier this month, the state Commerce Department said the environmental and socioeconomic risks of Enbridge's proposal outweigh the "limited benefits." "On balance, we found the costs outweigh the benefits," Bill Grant, the Commerce Department deputy commissioner, said on Thursday. "Enbridge has not demonstrated a need for the proposed project in our view." Grant's department in August issued an environmental impact statement on Line 3, saying that Enbridge's preferred route affects fewer water sources and cultural resources than its current pipeline, but affects more biological areas of importance. Richard Smith of Friends of the Headwaters, attended Thursday's hearing and said his group supports safe energy transportation. However, he said the group wants Enbridge to use an alternative route that bypasses lakes, wetlands and other natural resources. Ann Manning, who testified Thursday, said there's "overwhelming" evidence that we need to move off oil. "Future generations rely on us to step up and do what's right," Manning said. "We don't need any more pipelines." Those backing the pipeline say it will bring thousands of construction jobs and billions in private investment to Minnesota. "I believe in the good paying, middle class jobs that it would create," testified Tim Olson, a pipeline supporter. "It's also common sense to replace an aging pipeline with the newest and best technology available."